Earlier this year we promised to address some historical graffiti and the remaining questions raised though our forensic study of the stone side of the house. To understand how these remaining questions have been formulated, we need to first discuss the limits of what our study can reveal. It is worth noting that we have called these investigations a forensic study. Forensic science is normally used to help criminal investigators uncover and interpret legally admissible physical evidence from a crime scene and to determine what happened at that place. In large measure what we have been doing at the Stone House has been similar to what crime scene investigators do in their work. In both cases the effort involves uncovering evidence that has, at times, been deliberately concealed or inadvertently left behind by those involved in an action or an event. In both cases the deliberate, or unwitting, destruction of evidence as well as inconclusive discoveries or ambiguous physical details can lead to reasonable doubts about a proposed scenario of events. In the case of the Stone House, these remaining questions are not so much about if things were done, but more about when things were done. In our previous update about our forensic work we also introduced what we discovered behind a dado panel on the east wall of the stone side of the structure. Behind this paneling we found that most of the plaster was missing and that the stones there had been re-laid after the dado paneling was installed. The essence of this discovery was that there is a definite relationship between the time the dado panel was installed (it coming first) and the subsequent date the rear stone wall above the bulkhead entrance was re-laid. The stones laid behind the dado paneling also implied that the rear window on the east wall had been raised higher in that wall so that the dado panel could fit below it. Therefore, theoretically, if we can date the time that the rear cellar entrance was created, we could also get a better idea about when the dado panels were installed. As we have addressed in the past, and again in our previous post, there is a stone in the exterior wall with “1828” pecked into its facial surface above that bulkhead entrance and to the left of that window. If this date stone tells us when that rear wall was reworked for the installation of the back bulkhead entrance, then we also can be relatively sure that the dado panels inside were in place by 1828. The problem is that there is also graffiti on the back of one of the dado panels from the west (front or street-side) wall. Examination of all these panels has indicated that they were originally cabinet doors constructed with mortise-and-tenon joints. When they were made into dado panels, they were cut down and nailed together with machine-made cut nails that were typically used between 1820 and 1890. Some of the graffiti in question appears to date to the time when the dado panels were still being used as cabinet doors. One panel has the names of Ellis Long, R. Wells, and A. Pitman. These individuals were contemporaries who lived in Stephensburg during the later half of the 1700s and the early decades of the 1800s. There were two men with the name Ellis Long. The father who lived from 1758 to 1837 was likely the one that inscribed this graffiti. The “R. Wells” was most likely Richard Wells, who lived from 1779 to 1846, and the “A. Pitman” was most likely Andrew Pitman (the potter) who lived from 1760 to 1838. These were all prominent businessmen in Stephensburg at the same time that Henry Jackson owned the Stone House from 1802 to 1833. The graffiti on another one of the old cabinet doors that makes up this same panel is less clear. It includes doodling and what appears to be a signature followed by a date. The most discernible part of this graffiti is what appears to be the year 1837 or 1887. (See images below.) Could this mean that the dado panels were installed after this inscription was made, or could this inscription date to a time when the panel was temporarily removed by a worker? We may never know, but we are continuing to work on deciphering this inscription in hopes that it may tell us more. We also continue to prepare to install a new roof. In our next post we will address what this new roof will be like. Not only was this infill work necessary for bringing the house back to the way it looked in 1830, it was also required to stabilize the northeast corner of the stone side of the structure and serve as a foundation for the base of the roof structure frame. The job was made slightly more complex by the fact that two floor joists had been cut off in the early twentieth century to make way for the current staircase . When the staircase is removed as part of the future interior restoration work, the floor joists will need to be replaced. Pockets were left in the masonry at the right spots for the replacement floor joists to rest. The crew from Dominion Traditional Building Group was composed of Mike Ondrick (wearing the hat in the photo below), David Wood (without a hat in the photos below), as well as Glenn Courson, and Danny Mason. We are grateful for their enthusiasm and professional skills. We would also like to thank Tim Winther, Dominion Traditional Building Group’s Senior Project Manager, for overseeing this undertaking. The next steps we will take in the restoration will focus on the roof structure, the manufacture of shingles for the roof, and the chimney top. We will keep you up to date as we move forward. We have reason to believe that this is the year that this stone work was done in relation to the construction of the rear bulkhead entrance. If this is true then we know that the dado paneling was in place by the year 1830, the period to which we are restoring the Stone House. The nails used to construct the dado paneling are the type that date to as early as the 1820s. The modern flooring has also been removed and we have exposed the original floor boards. 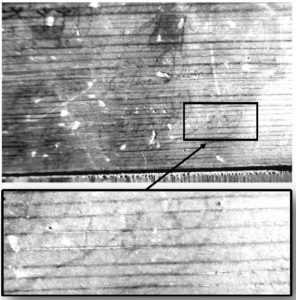 The marks on those floorboards reveal the place where the stairway landing was located and how wide that stairway was. 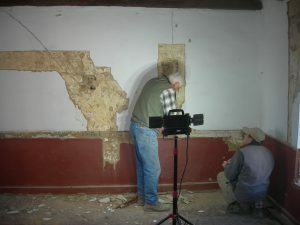 Additionally the dents and stains on the original floorboards have confirmed the location and configuration of the vertical board wall that was originally constructed in order to divided the first floor into two rooms. 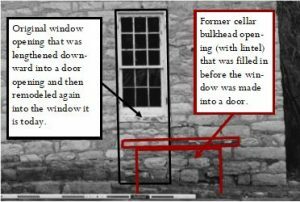 While the interior forensic work has reviled many clues that are helping us develop an idea of how the Stone House looked in 1830, there are still unanswered questions that stem from inconclusive evidence. In our future posts we will address some of these remaining questions as well as the historical graffiti we discovered behind the dado paneling. Ultimately, we hope to have more answers than questions. This year has been a busy one with our work on the Stone House. So busy that we forgot to include some updates here on the website that did make it into our newsletters. 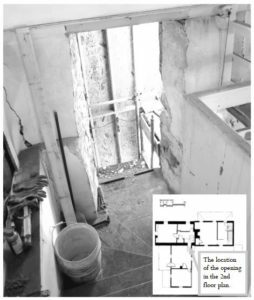 In the summer of 2016 we announced the discovery of the remaining foundation walls that belonged to a detached kitchen that once stood behind the Stone House. This detached kitchen was most likely built in the 1780s, when tavern keeper Peter Upp owned the property, and it was built at the same time as the north log addition on the Stone House. That detached kitchen had stood until sometime after it was mentioned in an 1843 deed that subdivided the property. 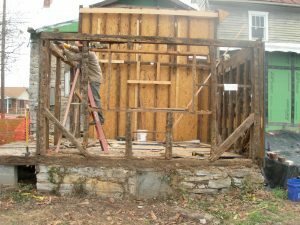 Until we discovered the foundation walls of the detached kitchen, we were operating under a theory that a timber-frame shed addition that was once attached to the rear of the stone side of the house was also there on the back of the house during the same time period. 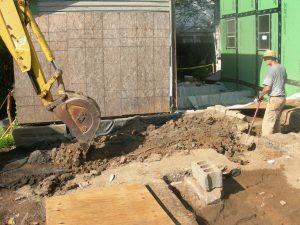 As we stated last summer, the big surprise came when we dug the test unit in the ground where we expected to find a stone pier that formerly supported the northeastern corner of that timber- frame shed addition. 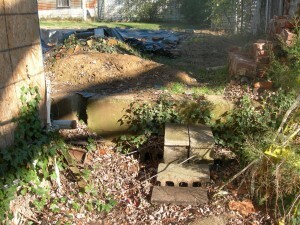 Instead of finding that pier we discovered the southwestern corner of the detached kitchen’s foundation wall. It is located in such a way that it disproved the theory that the shed addition was there on the back of the Stone House as early as 1830. 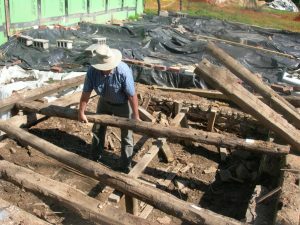 In fact, it is now clear that the timber-frame shed addition postdates our restoration period by as many as fifteen years. This is because two buildings cannot occupy the same space at the same time, and we know the kitchen was still standing on that spot as late as 1843, when the property was subdivided. Back in 2014 we had saved that timber-frame shed addition and left it standing on the same spot where it had been moved in the early 1900s. (See photo below.) Back around 1910 it was incorporated into the rear ell addition that was being built behind the stone side of the house. When we removed that ell addition in 2014, we envisioned restoring this timber frame shed addition back to its original place and reattaching it to the rear of the stone side of the house. That is no longer the plan. In the spring of 2017 we carefully dismantled this timber-frame shed addition and stored it away with its parts labeled and numbered. This work was done by Mr. Bill Wine (in the images below), principal of Historic Restorations, LLC of Woodstock, Virginia. Mr. Wine and his crew had been involved with the earlier work in 2014 to remove the additions behind the log side of the house and the other parts of the ell addition behind the stone side. The stones from the foundations of the additions are all being saved on site so that they can eventually be reused during the restoration project. The ground area that was just uncovered may yield more information when future archeological studies are conducted. We are keeping the site covered to protect these undiscovered resources of historical evidence. Late last summer we resumed work to answer the final questions about the 1830 appearance of the stone side of the Stone House. In the autumn 2015 we discussed concerns that were raised by Mr. Doug Reed, our historic structure consultant. Mr. Reed had noted that the size of the openings for the first-floor windows and doors were too tall and narrow for what was typically common during the time when the Stone House was originally constructed. 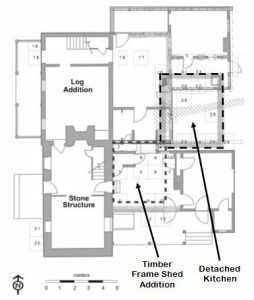 At the end of 2016 we revisited these questions and also considered how the first-floor window to the right (south) of the front door was at some time lengthened downward and turned into a doorway. Since then we have received the report on the archeological investigations that were conducted in 2016. In our last issue we recounted how the two test units excavated under that window, on the spot where there used to be a cellar bulkhead entrance, showed that the artifacts discovered in the bottom undisturbed archeological strata dated “from the late nineteenth to the early twentieth century.” In other words, the front bulkhead opening continued to exist into the early 1900s, when it was filled in again with dirt. With this fact in mind we now know that the first-floor window to the right (south) of the front door was still a window in the 1830 period. This is because the only way to make that window into a door was to lengthen it downward. To do that they filled in the cellar bulkhead entrance and cut its wooden lintel. Otherwise the lintel would be in the way of the lower half of the door opening that was being created. (See image below.) This also means that the front bulkhead entrance to the cellar was most likely open during the 1830 period and, therefore, it will need to be recreated in our restoration plan for the Stone House. 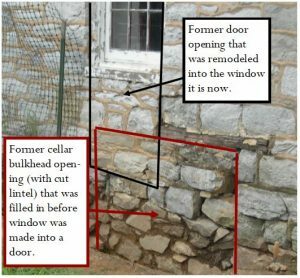 On the 14th of September 2017 Mr. Doug Reed resumed his study of the Stone House with a renewed examination of the building’s exterior and interior structural features. He began by refamiliarizing himself with the house and the bits of physical evidence that remain from the earliest period of the structure’s existence. One of the best ways to date architectural features is old hardware. And when it comes to window openings, one of the easiest ways to determine the age of the window frame in that opening is by examining the nails that hold it together. One of our most important recent discoveries tells us that the rear window on the stone side dates to the earliest period of the structure’s history. 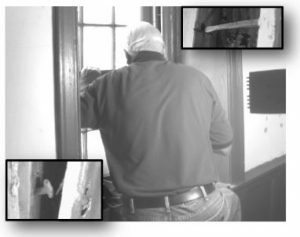 This is because Mr. Reed discovered hand-forged “T” head nails with “spoon bits” (that date to the eighteenth century) in the oldest molding of that window frame. (See photos below.) 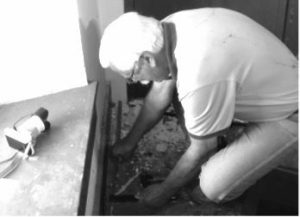 To make these discoveries Mr. Reed must gently pry wooden molding apart from the walls to which they are attached. (See photo below.) In turn, the nails are slowly revealing the story of the Stone House and what it looked like around 1830. 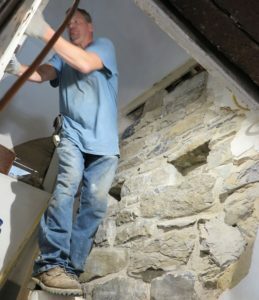 The work on the Stone House has progressed and we have expanded our study of the interior of the stone side of the structure to include the removal of plaster to look for clues inside the walls. 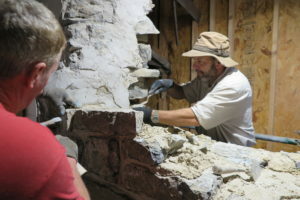 Our historic structure consultant, Mr. Doug Reed, calls this work “above ground archeology.” Similar to the archeology we conducted in the ground behind and around the outside of the Stone House, this forensic investigation of the structure’s interior walls involves the careful removal of layers to reveal trace evidence of past renovations and alterations. One of the features we are trying to learn more about is a stairway that was once located along the south wall of the first-floor room in the stone side of the house. 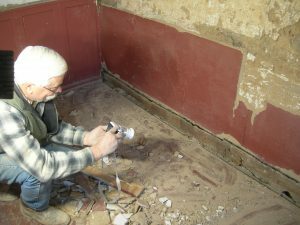 Mr. Reed, with the assistance of our President Butch Fravel, carefully chipped away the newest layers of plaster to uncover the trace evidence of that stairway. (See photos below.) 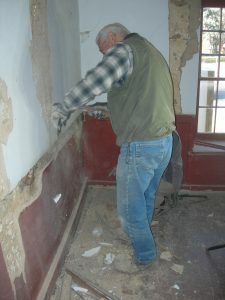 By carefully removing the plaster around and above the first-floor window openings in the front of the building Mr. Reed has been able to examine bedding mortar in the joints between the stones, and the hand-hewn wooden lintels over the openings. The verdict is that both the first-floor windows and the front door opening are in their original locations and they have not been widened. On the 1st of December 2017 we also discovered a baseboard in the south first floor room fastened with nails dating to circa 1810. (See image below.) This baseboard had been spliced in the middle and is located below the spot where the old stairway used to be on that wall. The nails in this baseboard may be a clue in helping us date the installation of that missing stairway. There is more to come. Keep checking back with us. 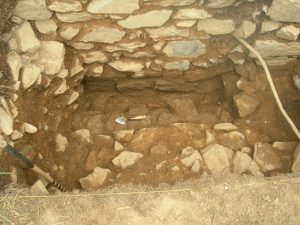 The report from Rivanna Archaeological Services (“R.A.S.”) has come to us and we want to share some of the things we have learned from it. Those readers who have been able to visit our museum and see the exhibit on those 2016 excavations that opened during this year’s Newtown Heritage Festival have viewed some of the artifacts that were discovered. They will also know that the majority of them were ceramic shards. These supporting quotations from the R.A.S. report give us a sense of the amounts of those materials. Ceramics recovered from the 2016 investigations were classified into four broad ware types, coarse earthenwares (n = 2,263), refined earthenwares (n = 2,502), stonewares (n = 112), and porcelains (n = 86). A total of 4,963 pieces of tableware and utilitarian ceramic vessels were recovered from all units. Coarse earthenwares composed 45.59% of the entire ceramic collection. Of the coarse earthenwares, redwares composed 96.24% (n = 2178), tin-glazed earthenwares 3.05% (n = 69), and slab or tile ware 0.71% (n = 16). Redwares were ubiquitous throughout the sites and in nearly every unit. This abundance of redware was not surprising. Stephensburg had two potters in the early period, the brothers Andrew and John Pitman. They mainly produced redware pottery in their shops as did other potters in towns around the region. In the September 2016 issue of this newsletter we told of how we hoped to discover undisturbed soil at the bottom of these test units (numbered 20 and 21 in the diagram below) that would hold artifacts dating to the time when this entrance was closed off. The report stated that the artifacts discovered in the bottom undisturbed strata dated “from the late nineteenth to the early twentieth century.” In other words, the front bulkhead opening continued to exist well into the early 1900s. This diagram from the R.A.S. report shows the floorplans of the Stone House with all its additions. Superimposed with dotted lines are the locations of the detached kitchen (based on its foundations discovered in 2016) and the original location of the timber frame shed addition (based on its foundation piers discovered in 2015 and 2016, and plaster remains on the east wall of the stone structure). The way these two structures overlap in Test Unit 22 illustrates how we know that the detached kitchen was gone before the timber frame shed addition was added to the stone structure. This graphic helps show the complexity of it all. The width of the current opening dictated the use of 6½” to 7” wide glass panes. The width of the sash and glass was also dictated by the rough masonry opening allowing 3½” to 4” wide jambs. For the height to fill the full opening without alterations, a 2” taller piece of glass in ratio to the width again dictated the use of 6½” x 8½” wide glass or the wider glass dimension may have been 7” x 9”. Using those height measurements the sash set that best fit the tall vertical size of the existing rough openings was 9 panes of glass over 9 panes of glass. Mr. Reed then pointed out that while nine over nine double hung sash windows were possible to make during the period, they would not have been found on a little stone house built in the backcountry of Virginia during the 1760s. He also noted that it was unlikely that these kind of undersized glass panes would be used in a nine over nine double hung sash window, and that it is likely that the rough masonry openings for these front windows were originally shorter. Additionally, he observed that the rough opening for the front door was too narrow for what you would expect to see for a circa 1765 doorway. 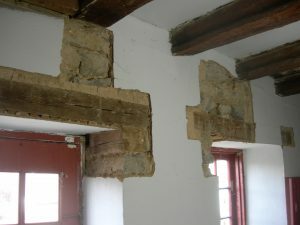 To answer the question of whether or not these window and door openings were altered, and if so, how and when the alterations took place, we need to look behind the surface plaster and trim on the inside of these openings. In 2017 one of our first priorities for the project will be answering these questions. We will be working again with Mr. Reed to hopefully come to some conclusions about what the stone side of the structure looked like in 1830. Additionally, we also know that the first floor window to the right of the front door was at some time lengthened downward and turned into a doorway. When this was done the workers cut the wooden lintel of the old front bulkhead opening leading down into the cellar. This cut lines up with the window opening in the stone work that was used to create the former doorway opening. (See images above and below.) After it had been used as a doorway for a period of time it was altered to the way it is now and used again for its former purpose as a window opening. This is a great example of the complexity of the situation we are facing with the fenestration on the front of the stone side of the house. After these questions are answered we will be able to move forward with the restoration of the exterior of the house in 2018. 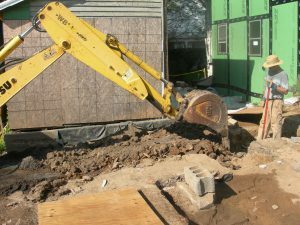 Part of this job involved filling in holes and a trench that had previously been dug by museum staff to uncover the old bathroom plumbing and sewer line. 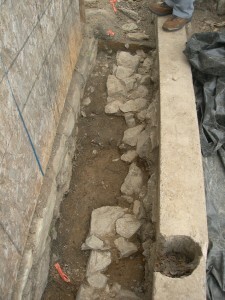 This infill work was done to prevent erosion which could threaten the stratigraphy of future archeology at the site. The area behind the log side is now prepared until the next time we employ Rivanna to come back and finish the next phase of the work. That final phase will involve completely uncovering the remaining foundation walls and the floor of the kitchen so that we will be able to make a plan to reconstruct that structure. Our purpose in studying these two units was to discover (if possible) the time period when this bulkhead doorway was closed off. This could hopefully be accomplished by examining the artifacts that came out of the undisturbed soil that was used to backfill the stairwell after the bulkhead was closed off. In theory, discovering artifacts dating to the period after the 1830s would indicate that this bulkhead opening would likely have been there in the year 1830, which is the target date of our restoration of the house. The challenge associated with these two test units was in the way they had been disturbed by previous activity. During the mid-twentieth century a water line was installed and a pipe was laid in a trench where we excavated the south test unit. (This pipe is visible in the photo above.) Later in the twentieth century we set our museum’s street sign in a posthole next to the water line. Thus, the majority of the soil coming out of the top layers of these units was useless for our purposes. We can only reasonably assume that the very bottom soil at the base of the stone stairs was undisturbed. 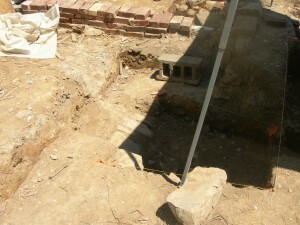 The artifacts discovered therein at the bottom of the stairs should tell us if the bulkhead was filled in after 1830. Rivanna staff are processing those artifacts now. We hope to have the results of their study by the end of the year. We will let you know those results and other news in the next posts. 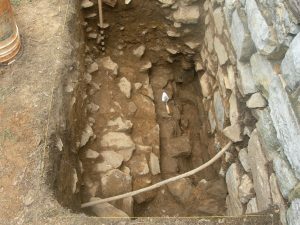 During the archaeological investigations carried out by Rivanna Archaeological Services from the 20th to the 30th of June 2016 we discovered the remains of the foundation walls of the detached kitchen that was mentioned in a deed that subdivided the Stone House property in 1843. While the northeast corner and some of the eastern foundation walls of that kitchen were destroyed when a water cistern was installed in that area of the ground at a latter date, we now have a very good idea of the original footprint and layout of that detached kitchen. This detached kitchen was certainly the place where some of the slaves owned by Henry Jackson lived and worked. 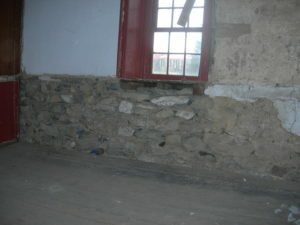 One other factor that could be a game changer for our restoration plan is that the southwestern corner of these foundation walls is located in such a way as to cast doubt on the idea that the shed addition that was formerly attached to the rear of the stone side of the house was there as early as 1830. 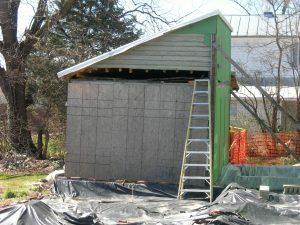 In fact, it is now looking like that shed addition postdates our restoration period by as many as fifteen years. This is because two buildings cannot occupy the same space at the same time and we know the kitchen was still standing on that spot as late as 1843 when the property was subdivided. 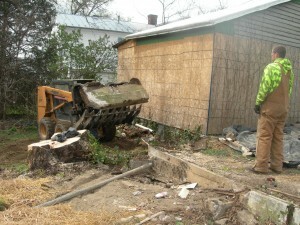 The crew from Rivanna is not completely finished with their work. Stay tuned. There is more to come. Black ash stained soil outside the southwest corner of the kitchen foundation wall. The remains of the south foundation wall of the kitchen that was over the old property line and encroaching slightly on the yard behind the stone side of the house. 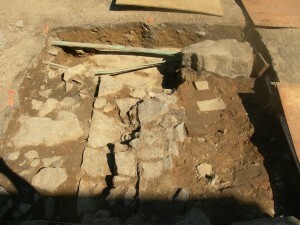 The remains of the north foundation wall and possibly a hearth area of the kitchen. 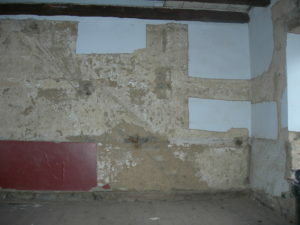 A test unit over the west wall with the possible doorway threshold and the original dirt floor of the kitchen. 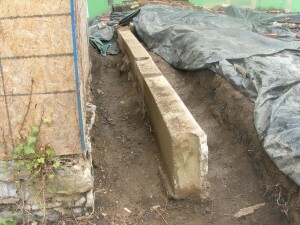 On the 8th of April we witnessed dramatic changes in the rear yard behind the log side of the Stone House. As we discussed in our last post we were needing to remove the twentieth century obstacles that stood in the way of our archeological search for evidence of the detached kitchen that once stood in the rear yard behind the Stone House. Before moving forward with the demolition we thoroughly documented the shed and saved the hardware for our collection. Once that was complete we called in our contractor who took down the latticework fence, the overgrown shrubs, the silver maple tree, and the old garden shed that had belonged to the Argenbright family. 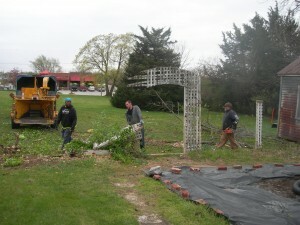 The work was accomplished quickly with the aid of some heavy equipment. 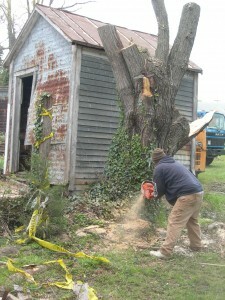 Among the most critical steps in the process were the demolition of the shed and the removal of the silver maple tree. They were located in the area of the old property line that formerly subdivided the stone side from the log side of the lot. It was along this former property line that the old detached kitchen once stood. Removal of the latticework fence on the 8th of April 2016. Cutting down the trunk of the silver maple tree on the 8th of April. 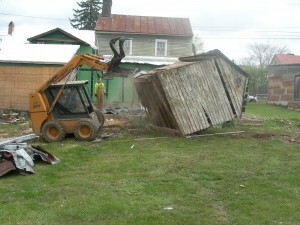 Tipping over the old garden shed as a part of the process of its demolition on the 8th of April. 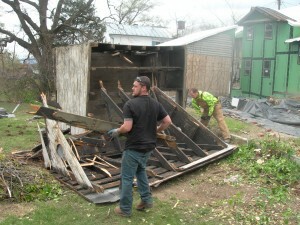 Dismantling the old garden shed. The last step in the process was the removal of the corner section of the concrete retaining wall that had been constructed along the old property line. Days after the contractor finished that step we then began to remove the fill dirt on both sides of the remaining section of the concrete retaining wall. After consulting with the archeologists who will be excavating there soon we have decided to hold off on the demolition of the concrete retaining wall that ran along the old property line. We were concerned that the work might disturb features in the ground that we are still looking for. Removing the corner section of the concrete retaining wall on the old property line. 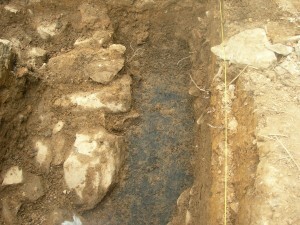 After the fill dirt was removed from both sides of the old concrete retaining wall the base of the feature could be studied by Rivanna Archaeological Services. Once we are sure that we have found no danger of destroying archeological evidence in the area of that concrete retaining wall we will call the contractor back so that he can demolish the remaining section of that retaining wall with a jack hammer. We hope that somewhere underneath this concrete retaining wall, along this section of the former property line, we will discover the foundations of the old kitchen. We will keep you posted. As 2015 comes to a close we can look back with a degree of satisfaction at the progress we have made toward our goals. We have discovered important clues about the evolution of the exterior appearance of the Stone House, and we are poised to uncover more in 2016. 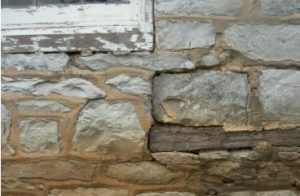 In our last post we discussed the questions we still have about the windows in the front of the stone side of the house and how the findings of our historic structure consultant Doug Reed have given us insights into the ways we can answer those questions. Among the things Mr. Reed has recommended for our immediate future is to complete “all archaeological studies as soon as is reasonably possible.” Additionally he stated that it is “imperative the grounds immediately surrounding the structure be graded to drain water away from basements and foundations.” In turn, we have drafted a request for proposals seeking bids from professional archeology firms to have this work done in 2016. With the helpful comments of Mr. Bob Jolley, our resident Archaeologist with the Virginia Department of Historic Resources, and Dr. Dennis Blanton, who helped us with the excavations earlier this year, we have developed a plan to accomplish the work that is outlined in this request for proposals. This wall was constructed during the mid-twentieth century by the Argenbrights, who owned the north side of the lot at that time. It was made to hold fill dirt poured in over the historic ground surface. The Argenbrights did this to create a level courtyard directly behind the rear additions of their side of the house. Prior to that time there was a natural slope in the grade downward toward the east/southeast. The southern portion of this retaining wall was constructed along the old property line that had been drawn in 1843, when the lot was divided between the stone side and the log sides of the house. That same deed mentioned how the detached kitchen we are looking for once straddled the old property line. To conduct the archeology and uncover the remains of that detached kitchen, we must carefully remove hundreds of pounds of fill dirt before demolishing the concrete retaining wall. Only then will we be able to excavate test units along that old property line in the area where that detached kitchen may have been located. Two other obstacles that must be removed that also are located on that old property line are a silver maple tree and a frame shed with rolled steel siding that dates to the mid-twentieth century, when the Argenbrights owned the north side of the lot. (See photo below.) 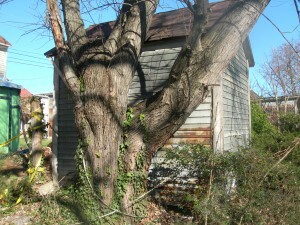 The shed will have to be removed first, as the tree has grown against it and has started to force it off its concrete block piers. In the north wall of this shed is a double hung sash window that probably was originally part of the log side of the Stone House. It will have to be saved and studied. Next year promises to be interesting. The southeastern corner of the concrete retaining wall along the old property line. 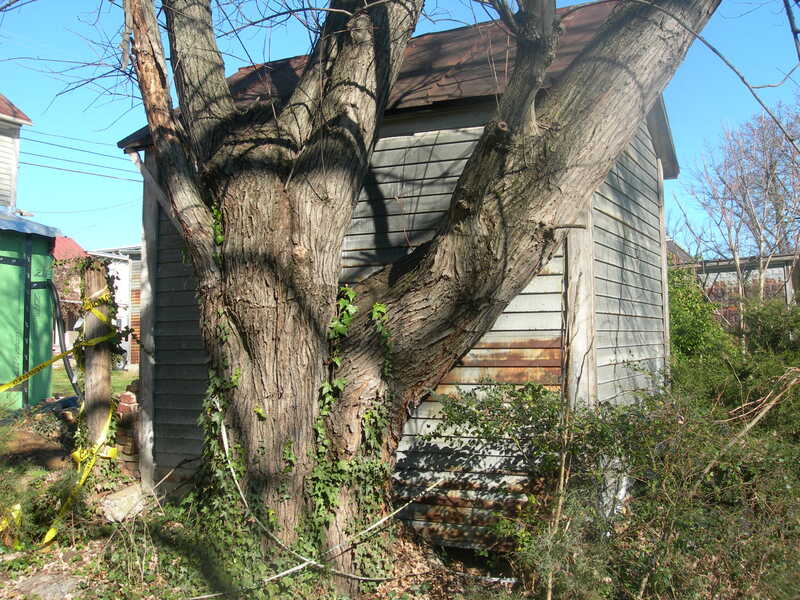 The silver maple tree and the old shed on the old property line.